Jusques au ciel où les dieux ont leur temple. Sur les plus beaux fantastique un exemple. Que tiedement hors de mon chef je ruë. Pein, Denisot, la beauté qui me tuë. Right to heaven where the gods have their temple. Conjure up an idea based on the fairest of them. Which run warm down my face. Paint her, Denisot, that beauty who is killing me. Sadly only a portrait of Margaret of Navarre, as frontis to the Tombeau de Marguerite de Valois which he published in 1551 (and to which Belleau, Baif, Dorat and Ronsard contributed). In its woodcut form, it cannot I fear give us much of a feeling for his abilities as a portraitist. Nevertheless it was not just Ronsard but others of the Pleiade who (in verse) seek Denisot’s afforts to capture the image of their beloved. The helpful Muret tells us that in line 8 ‘fantastique = draw with ‘ta fantasie’: Fantastique is here a verb…’. Sonnet 134 is already on the blog (here); so here’s no.135. Que languir froide, et n’estre point servie. Quelque peu d’aise en aimant il faut prendre. Sans rien sentir le corps n’est plus que cendre. Than sitting listlessly and coldly, accepting no service. You must relax a little in love. Feeling nothing, the body is nothing but dust. Tes passetemps en aimant il faut prendre. Sans plus aimer, nous ne serons que cendre. You must spend your leisure in love. With no more love, we will be only dust. (The next poem in the book is the “Stances” (stanzas) – the first poem not in sonnet form in the book. It is already on the blog (here), along with the two following sonnets nos. 136 and 137. So the next entry will be no. 138! 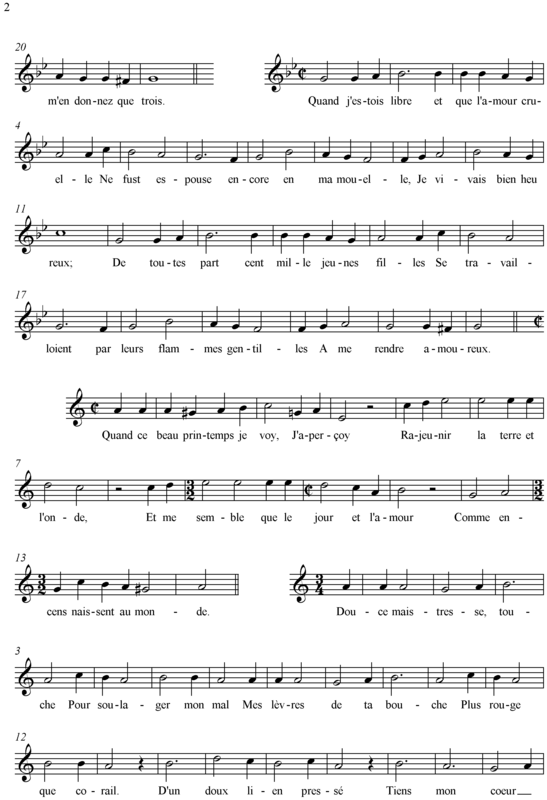 In my introduction to the musical settings of Ronsard, I mentioned in passing the voix-de-ville or vaudeville, the popular songs which used (or re-used) Ronsard’s poems in a simple melodic line. When performed, there was presumably an improvised accompaniment. This is probably as close as we can get to the sort of singing of his poems that Ronsard speaks of in his verse, the poet or reader singing the words while creating a (simple, improvised?) lute accompaniment. I hadn’t intended to say much more about them; but then I found a few transcribed so I thought it would be interesting to put them beside the ‘art song’ settings. Naturally enough, such popular settings rarely survive. But in the 1570s Jehan Chardavoine published a collection. Scholars have been divided on whether he collected genuine tunes (which puts him a century ahead of the antiquarians who sought out and recorded aspects of the world around them in danger of disappearing; and several centuries ahead of the 20th century folksong collectos like Bartok and Vaughan Williams); or whether he composed his own tunes in a ‘folk-like’ style. 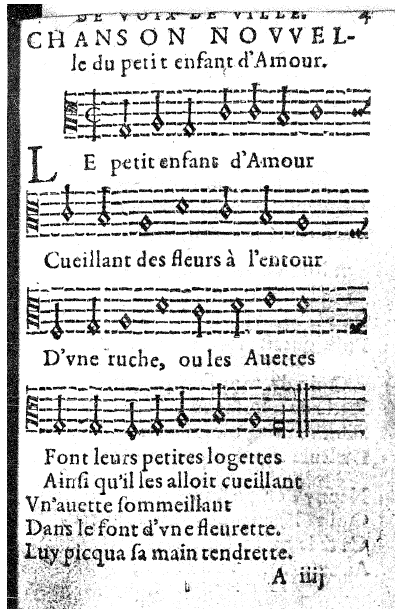 In some ways, it doesn’t matter: as long as these tunes sounded like contemporary popular tunes people might hear in the street, then they give us a good idea of what these Ronsard poems might have sounded like when sung. In these settings I’ve just set out the tune; inevitably there would have been several ‘verses’ sung, with more of the original poems in them, but I have not reproduced those additional texts. (recorded extracts here and here. I have used Tiersot’s transcriptions for the first five. EDIT: since discovering that Henry Expert’s work is still in copyright, I’ve re-edited the last two myself from the original source – and added copies of the pages too. The first recorded extract is from an old LP by Hugues Cuénod, called “French Troubadour Songs”(!) which I found here though I’ve also seen it on YouTube. 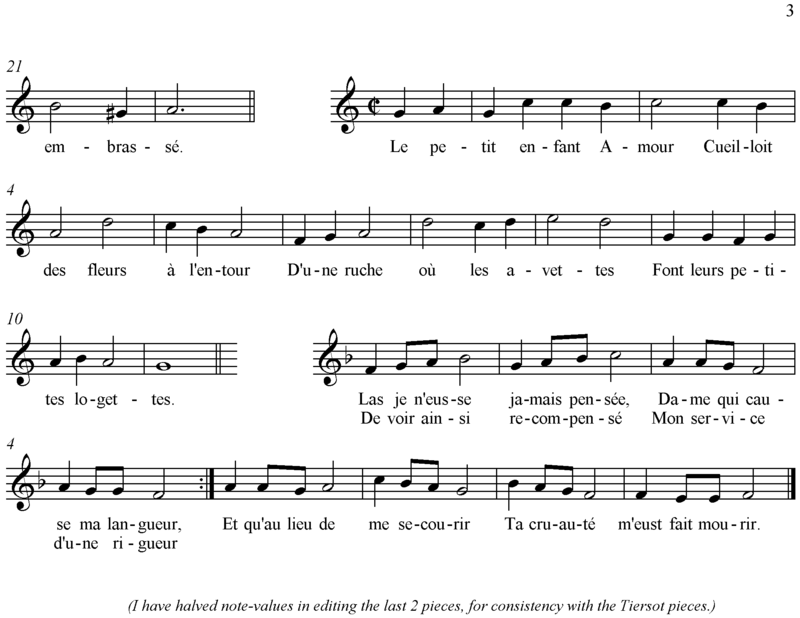 It is a version of ‘Quand ce beau printemps’ whose metre follows Chardavoine closely but whose melody is a little different. 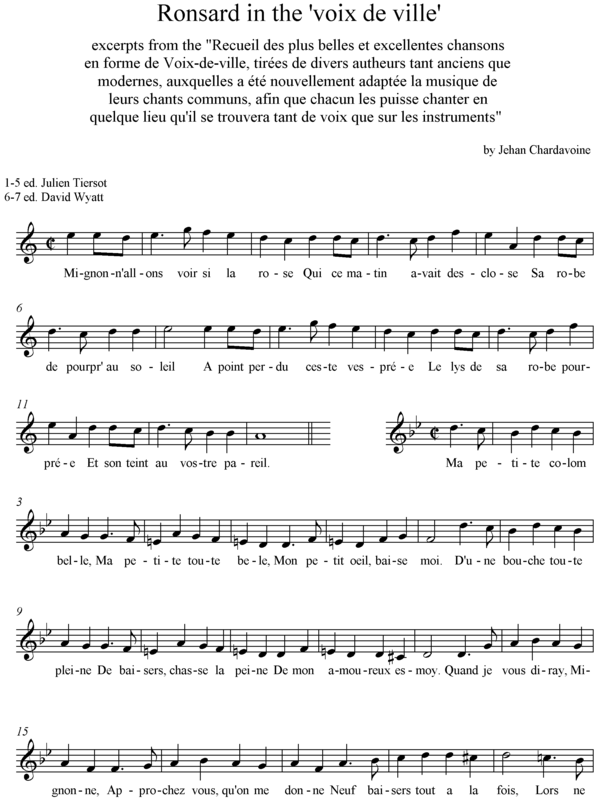 The second extract is a realisation of ‘Mignonne allons voir’ from a CD which is centred around Chardavoine’s book, and which (delightfully) uses the talents of a range of youngsters on instruments and voice, supplementing the professionals who do most of the work, in a way that reflects what Chardavoine might have intended! The CD is called Mignonne … allons voir, by The Muses’ Fellows. A mon malheur je la sens veritable. Par qui je suis douteux et miserable. Je cognois bien sa gentille nature. Non pour ta mort, mais bien pour t’endormir. To my misfortune I feel it truly. Who makes me doubtful and wretched. I know her gentle nature well. Oh, true Argus, how you make me sigh! Not bringing you death but rather sleep. Sometimes Ronsard’s use of his classical learning is there to make you smile rather than think hard. Today is one of those days! Argus was the hundred-eyed, never-sleeping watchman who guarded Io from Jupiter; Mercury, the trickster, charmed him to sleep and then (in the myth) killed him. After deciding to include sonnet 132 (from 1572) in his 1560 edition, Blanchemain obviously felt relaxed and included this one as well while noting he took it from the last 1584 edition! His version is identical. He quotes Muret’s footnote – which incidentally comes from the 1560 edition! – in which Muret states that ‘this poem in no way belongs to Cassandre’. I don’t know why he came to that conclusion, unless it was ‘inside information’ from his friendship with Ronsard and acquaintance with his poems. Que ta senteur embasme tous mes sens. Pour prendre un jour ta racine en ma vie. That your fragrance perfumes all my senses. So that you may for one day plant your root in my life. Despite a shorter history (Blanchemain notes that it dates from 1572, which doesn’t stop him including it in his set based on the 1560 edition!) this poem is not short of variants. It was the sestet that caused Ronsard difficulties. Beside the version above (the last), we may put the following variant of the last two lines, from 1572: I’ve included line 12, to highlight the different punctuation. Et mes pleurs d’eau pour te donner la vie. And my tears the water, to give you life. I cannot claim to have gone back & re-consulted the original editions (tempted as I am! ), so I will assume – for the moment – that the M-L text printed at the top is a combination of these two versions prepared by the editor rather than Ronsard’s own final thoughts. Mostly retaining the 1572 text, but re-using line 12 from the 1584 version, Ronsard tried again. Note that, though retaining the 1572 text for the first tercet, and the 1584 text for the second, lines 11 & 12 are switched round to retain the c-c-d e-d-e rhyme scheme of 1572 rather than the c-c-d e-e-d of 1584. Que j’endoroy, Dame, en votre service. Vergers de Gnide, Amathonte ou d’Eryce. Which I endure, my Lady, in your service. Orchards of Cnidus, Amathus or Eryx. Would sacrifice themselves as an offering. Is there a little slip in Ronsard’s clasical learning here? In lines 7-8, Cnidus was a wealthy city on the Ionian coast (SW Turkey) – though it was wealthy through trade rather than agriculture; Amathus was an ancient royal city of Cyprus, rich in grain; and Eryx (now Erice) is in Sicily, an island which was traditionally a grain-basket for the Mediterranean. So the reference to “vergers”, taken broadly as agriculture rather than specifically ‘orchards’, is generally fine. But why “Cyprus, or … Amathus”? if Amathus is (by extension) used to represent Cyprus?? Today is also one of those days when you (almost) get two poems for the price of one: at least, the second half is substantially different. 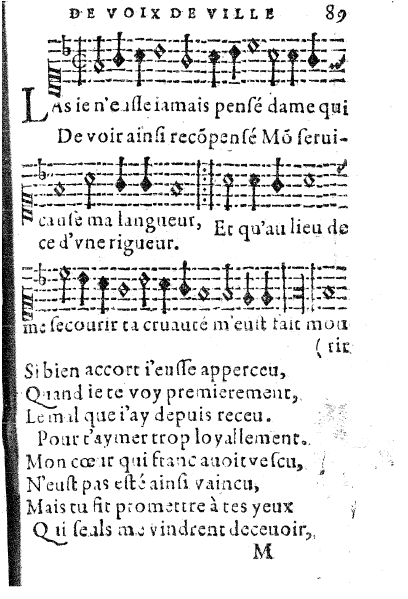 Blanchemain offers a couple of variants in line 5 – “Un coin vraiment plus seur ne plus propice” (‘A spot truly more certain and more favourable’) – and then the following sestet. The first tercet is clearly weaker; the second providing, instead of a medieval image, a classical one (dedicating an offering by hanging it in the temple, reminding me again of Horace’s ode 1:5 – see here). J’appenderois mon ame pour offrande. I would hang my soul as an offering. Lia mon cœur de ses cheveux surpris. Deux ou trois jours sans plus me tiendroient pris. Flatte mon cœur d’une esperance vaine. Bound my heart, caught unawares by her fair locks. Would hold me for two or three days, no more. Deceives my heart with empty hope. The form of the date above wasn’t Ronsard’s only attempt at a metrical form: Blanchemain’s edition gives us some earlier thoughts – and here to reflect the different words I’ve tried varying the translation too. Lia mon cœur, de ses graces espris. Bound my heart, captured by her gracefulness.